Look around. I am pretty sure more than one person in your vicinity is on their smart phone. Yes, we use mobile devices for entertainment and communication, but we also use it a great deal for business. According to a study done by Google this year, over 51% of smartphone users have discovered a new company or product while doing a search on their smartphone (source: HubSpot). And you do not want to lose out on leads from the growing mobile internet user market. So make sure your website can be viewed effectively on a mobile device and is fully optimized for it. To better understand your website, start with our website audit. Trust is important when it comes to doing business. A potential customer has to trust that your products are good, and that your service is dependable. A way to demonstrate this is by having testimonials and reviews up on your website and third-party sites. Use photos of the person who has written the testimonial or incorporate a video review, this will go a long way in convincing your website visitors about the credibility of the services and products your organization offers. One size does not fit all. That is to say a tactic that works for a particular website, when it comes to generating leads, might not work for your business’s website. So, I cannot stress enough the importance of testing and reassessing you website from time to time. From the layout of a landing page to the CTA design, it is imperative to perform A/B testing. A simple testing can improve the click-through rate tremendously. Marketo did some research this year and found that 68% of B2B companies use strategic landing pages to acquire leads (source: HubSpot). Internet users have very short attention spans. They hardly spend a few moments on something before moving on, so you better makes sure your business’s website landing page is engaging and clear. It should be well designed and informative with a clear CTA. Using a micro-landing page is another good way to increase conversion rates. Going back to the whole short attention span thing, a business needs to comes up with way to keep the attention of their website visitors. A way to do this is by making the website interactive. Use explainer videos, have live chat options, embed quizzes, place pop-ups—there are many options to choose from. You have to make sure you place these elements on your website in a non-intrusive and subtle manner, which will take some amount of trial-and-error. There are many more tactics when it comes to optimizing your website to generate leads, such as personalised content, lead nurturing, calls-to-action etc. 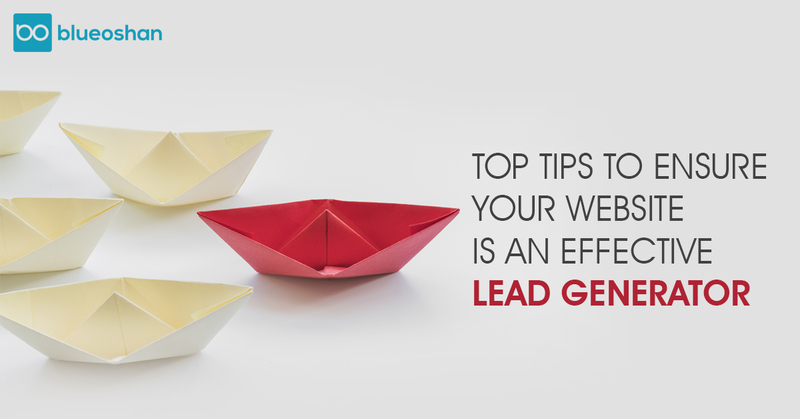 We can help you incorporate the right strategies to turn your website into a long-term lead generator. Set up a meeting with our Growth Marketer to learn more.